Hope you had/have a wonderful weekend! 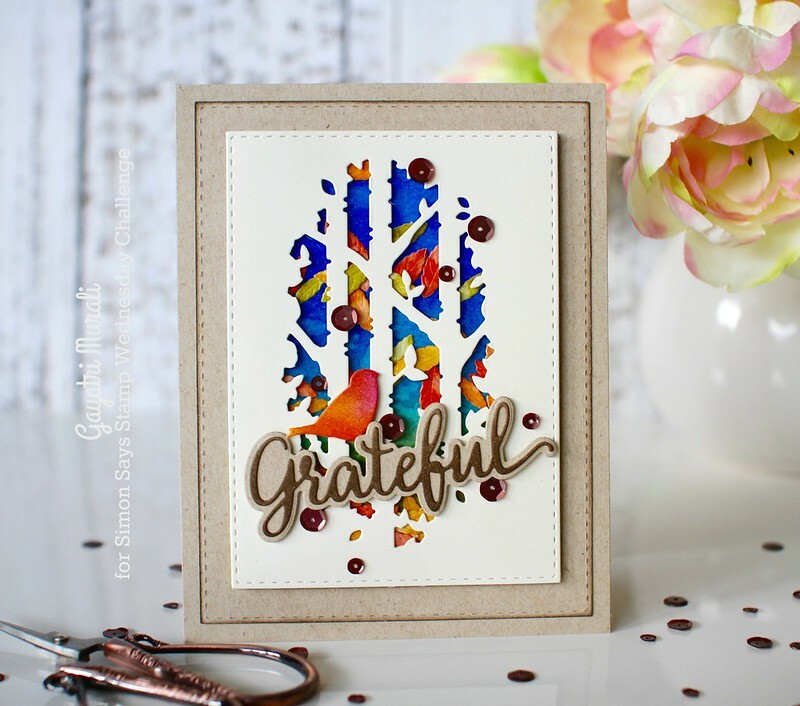 I managed to make a card over the weekend using new STAMPtember® release from Simon Says Stamp. 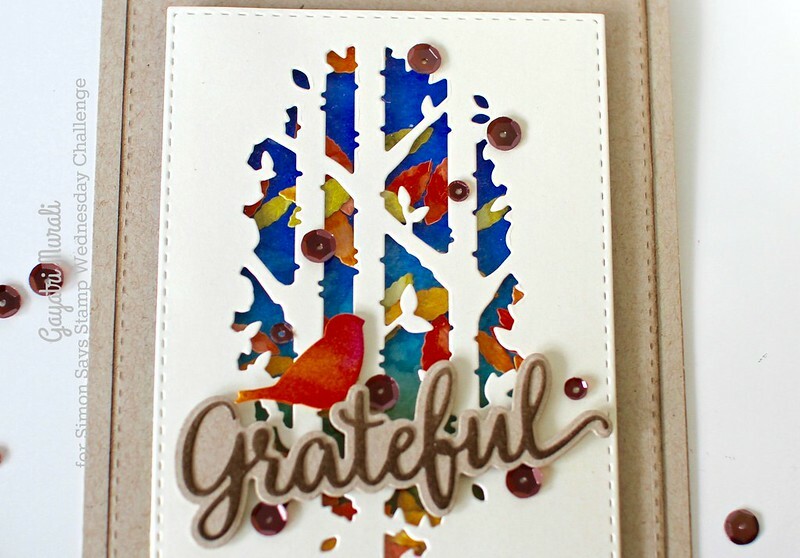 I have used Birch Tree Window and Grateful die from the STAMPtember® release along with older die from Simon Says Stamp called Songbird Branch die to make this card. I die cut a small stitched panel using cream cardstock and Stitched Rectangle die set. Then I die cut the Birch Tree Window in the centre of the panel. I added acetate behind the panel. For the background, I sponged Blueprint Sketch, Mermaid Lagoon and Peeled Paint distress ink on watercolour paper. Then I spattered some water, dabbed the water and when dry, sponged some more of the inks. I repeated this process couple of times to build layers. I really wanted the bright ink blue on the background. I also sponged some autumn colour distress inks – Wild Honey, Craved Pumpkin, Ripe Persimmon and Crushed Olive distress inks on watercolour paper. Spattered with water and dabbed the excess out. Once dry, I used the leaves die from Songbird Branch die set to die cut several leaves from all these colours. I added these leaves on the blue sponged background panel and adhered the Brich Tree Window panel using foam adhesive to create a shaker element. I adhered this shaker panel on a stitched rectangle kraft panel which is adhered to the kraft cardbase. 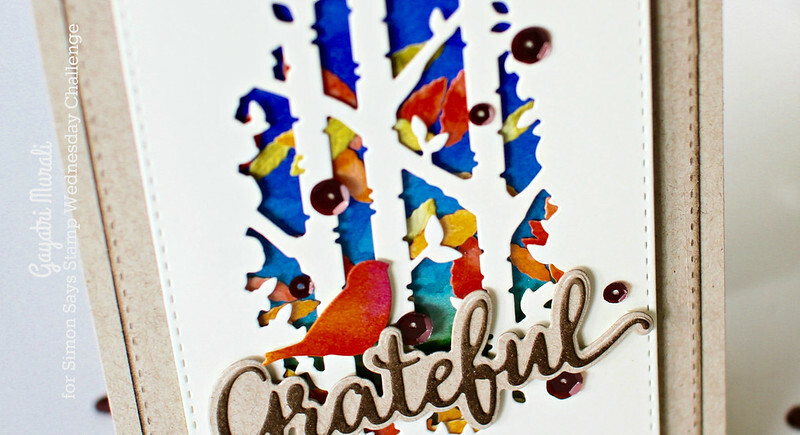 For the focal point, I die cut the bird from Songbird Branch die and sponged with distress inks Ricked Raspberry, Mustard Seed and Ripe Persimmon. 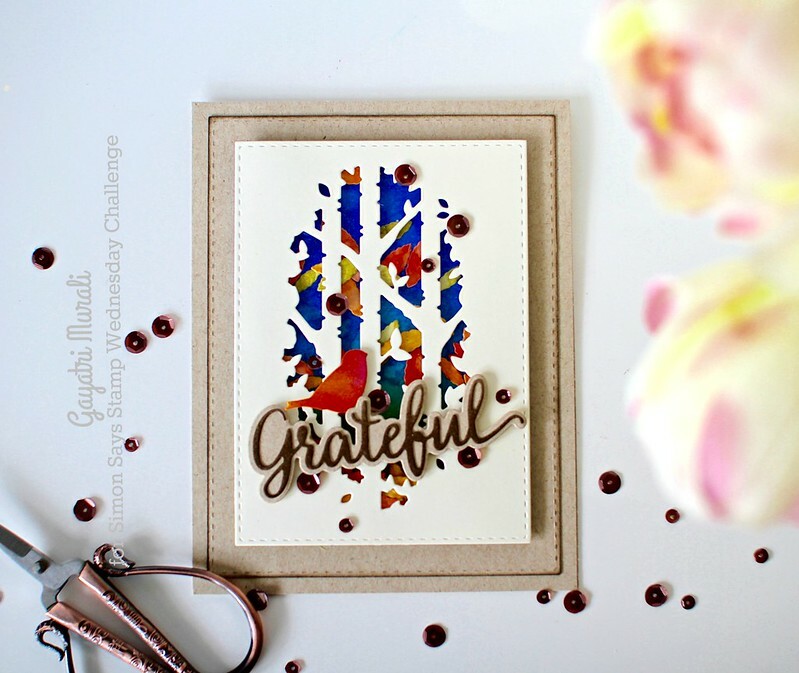 I also sponged a cream scrap cardstock with Espresso Distress ink and die cut the sentiment Grateful. I also die cut the outline of the sentiment using kraft cardstock. I adhered the sentiment on the outline die cut to foam adhered the entire sentiment to the card front. The bird, I adhered using foam as shown. Finally embellished with Espresso sequins from Pretty Pink Posh. Love the colours on the card and CAS feel to it. Hope you like it too. As always I have listed all the supplies I used to make this card below. Simply breathtaking! Love that birch tree window.